From the moment I announced that my partner and I were engaged, people had two questions. First: Have you set a date? Followed immediately by: Are y’all having a book-themed wedding? Long before we had an answer to the first question, we knew the answer to the second: YES. It was hardly a decision at all. After all, my fiancé did propose with a book, so it only makes sense. 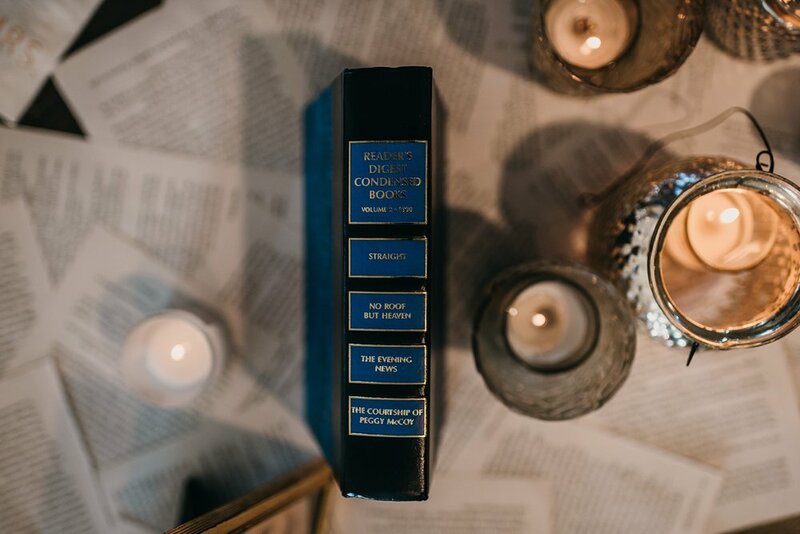 For a couple that spends as much time reading and going on dates to bookstores as we do, the idea of a book-themed wedding is emblematic of our relationship. Instead, we did a low-key, general book theme and worked in cute bookish elements without adhering closely to one particular book. The bookishness was in the details. My new mother-in-law is quite craftsy, so when I told her I wanted a book page bouquet, she was up for the challenge. She did most of it herself, though I helped out and made a few myself. Good thing the dear woman is retired because each of those flowers took 15-20 minutes to create. But as much trouble as that might sound like, it was cheaper than live flowers and I didn’t have to panic about their freshness on the big day. If you want to make your own, check out this post. My book bouquet was complemented by my husband’s book page boutonnière, which my mother-in-law also made. Funny story: it kept falling out of his suit jacket pocket, but thankfully it stayed in long enough to complete the ceremony! We also had a subtly book nerdy entrance song: “Manchester” by Kishi Bashi. Provided to YouTube by BWSCD, Inc. Manchester · Kishi Bashi String Quartet Live! ℗ 2015 Joyful Noise Recordings Released on: 2015-11-13 Auto-generated by YouTube. 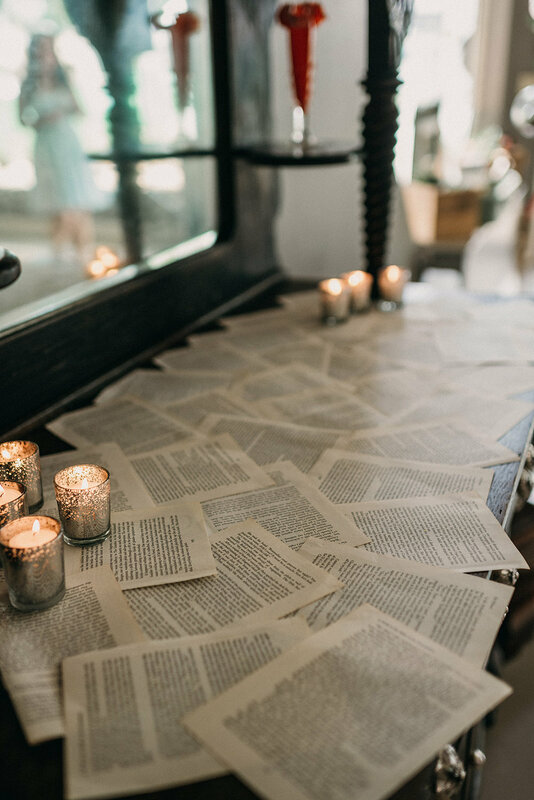 We incorporated more bibliophile details into the reception, including the table decorations. We bought the vintage Reader’s Digest books in bulk off Etsy and the table runners are just book pages taped together in one long strip. Cheap and cute! I also asked a friend who has excellent handwriting (she’s a teacher), to make me a sign with one of my favorite Jane Austen quotes. We also invited the right people because one of the first presents we received in the card box was a coffee table book about public libraries. And there was a gift certificate to a local bookstore inside! Our friends get us. 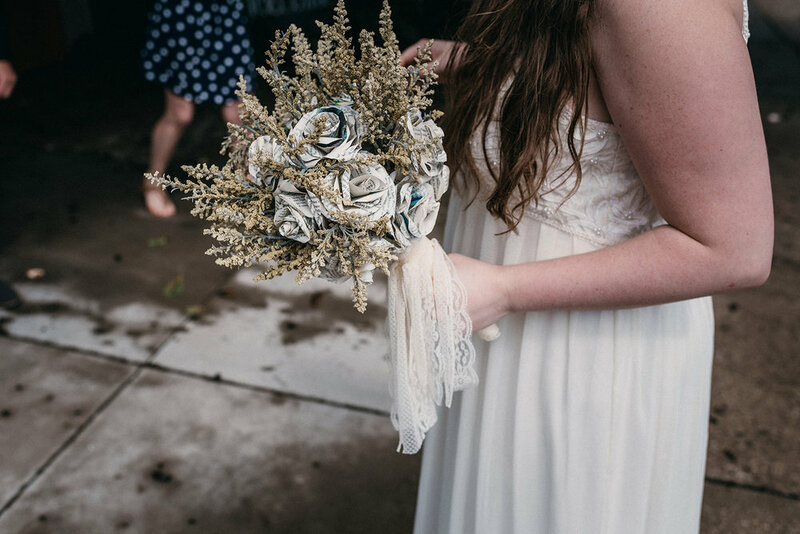 Our wedding was a small affair, paid for entirely ourselves, and while all of our decorations were cheap or handmade, I feel like they encompassed our bibliophile aesthetic beautifully. And last but not least, the picture you’ve all been waiting for: the happy couple! Not even the rain could stop us! All photo credit goes to 222 Photography in Columbus, Ohio. Subscribe to my email list to get more fun updates like this, as well as tips on how to blow past your reading challenge goals.